I'm a big fan of sukiyaki. Yakimix Sushi and Smokeless Grill Restaurant has a station where you make your own sukiyaki. Sukiyaki is one of my favorite Japanese dishes. I didn't do one here because I want my sukiyaki ready made. The dim sum station features siomai, chicken feet, siopao, and other favorite dim sum dishes. I didn't try this part too. The dessert station is another okay spot. Then again, it's nothing so special. I sure can have a better selection in various other restaurants. 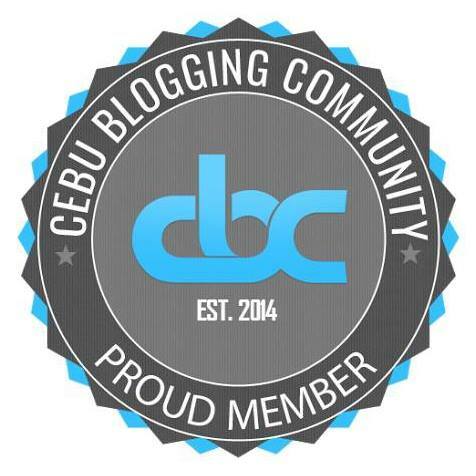 They have make your own halo-halo, cake squares, marshmallows and chocolate fondue, and a variety of other desserts. I wasn't too impressed with the other main courses at Yakimix as well. I took some lechon kawali, Korean sweet and spicy squid, salt and pepper salmon, and adobo rice. I don't remember enjoying any of them. And as one of my friends would say, it seemed like everything tasted alike. 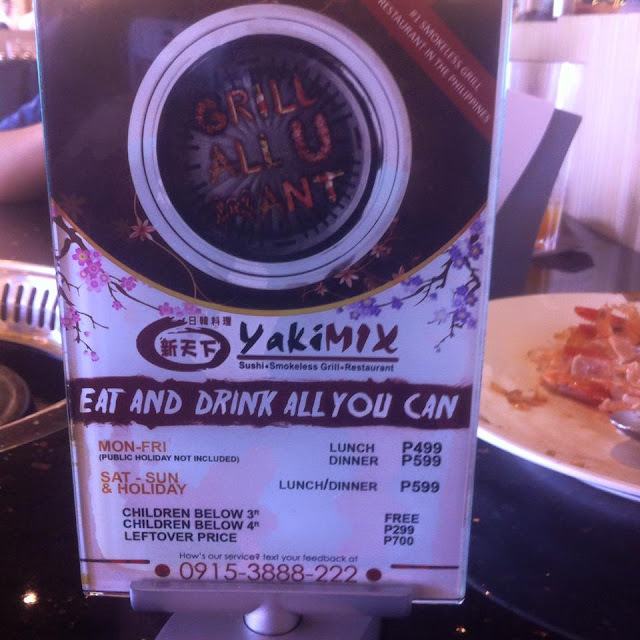 Yakimix prides itself to be the number one smokeless grill restaurant in the Philippines. True enough, very minimal smoke comes out of its grilling stations which is found in virtually every table of the restaurant. 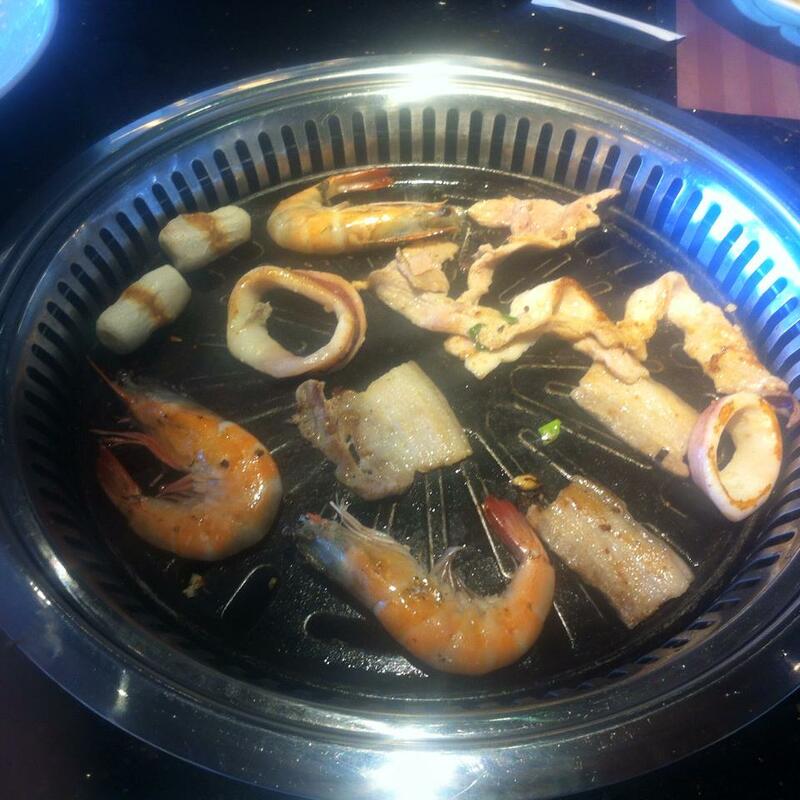 The section where you take items for grilling are divided into two subsections: meat and seafood. I got some liempo roll, pork marinated in garlic, squid, and shrimps to grill. It's a good thing that some of the items are already seasoned or marinated. For the items that were not marinated, make sure to make your own sauce to give it some flavor. This allows you to focus on the grilling and worry less about seasoning and experimenting with flavors. Although you are also free to explore. Cold and hot beverages are available at the Yakimix beverages section. Hot beverages are coffee and tea. For cold beverages, there are a number of juices, iced tea, and soda one can choose from. 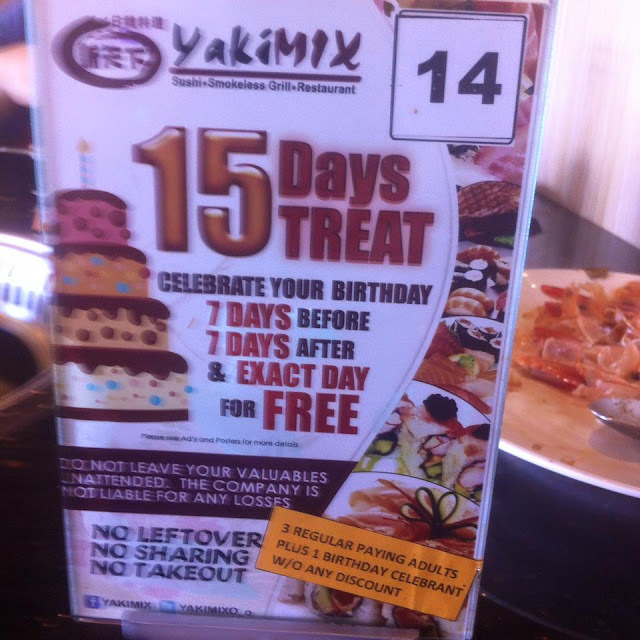 Yakimix has a 15 days treat birthday promotion. Birthday celebrants can avail of a free buffet 7 days before their birthday, 7 days after their birthday, and on their birthday itself. 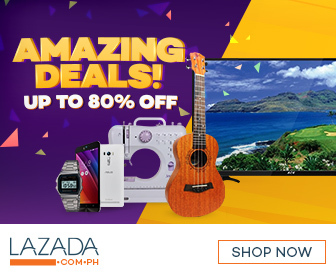 They just need to bring with them a valid government-issued identification card that indicates their birth date and three full paying guests to avail of the birthday treat. As I said in my opening paragraph, Yakimix is over-hyped that it can somehow disappoint. I expected better flavors but as one of my friends puts it, seems like all the food tasted the same. I would rank Yakimix a notch higher than Panda Star but they are probably just in the same league as The Port Restaurant and Joven's Grill in terms of flavor. Two out of five stars I would say. Yakimix Sushi and Smokeless Grill Restaurant is located at the ground floor of the NIC 2 Building at the Capitol Square, N. Escario Street, barangay Capitol Site, Cebu City. They may be reached through telephone number +63 32 254 7499 or +63 32 254 7501 or mobile number 0915 3888 222. You may visit the Yakimix Facebook fan page or interact with them on twitter with their handle, @yakimixo_o. 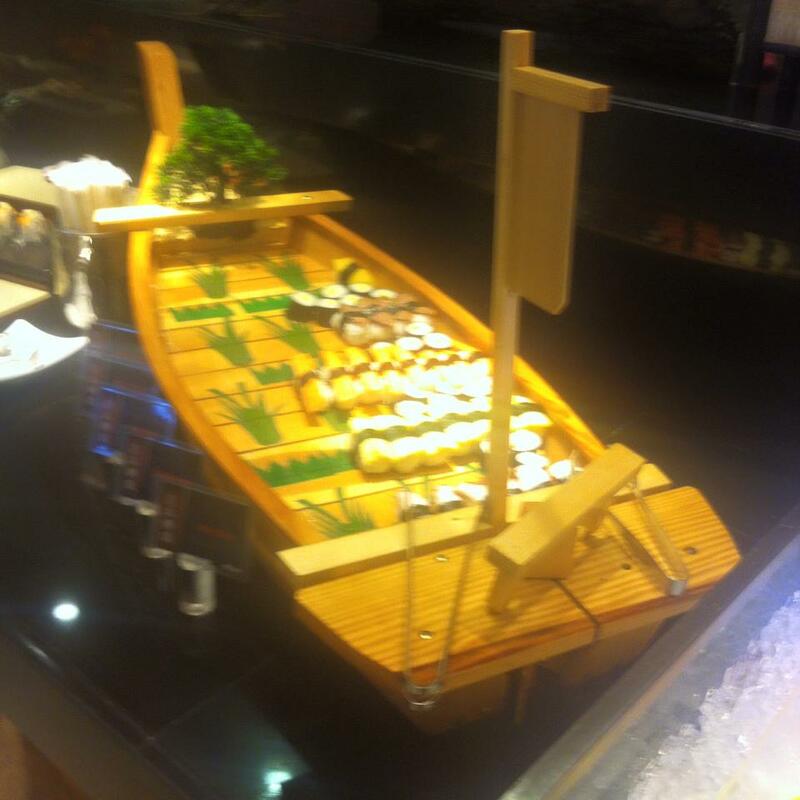 Have you tried the buffet at Yakimix? How was your experience? You may share them in the comments below.